Promise is an OPNFV requirement project. Its objective is to realize ETSI NFV defined resource reservation and NFVI capacity features within the scope of OPNFV. Promise provides the details of the requirements on resource reservation, NFVI capacity management at VIM, specification of the northbound interfaces from VIM relevant to these features, and implementation plan to realize these features in OPNFV. Different SDOs and communities use different terminology related to NFV/Cloud/SDN. This list tries to define an OPNFV terminology, mapping/translating the OPNFV terms to terminology used in other contexts. Administrator of the system, e.g. OAM in Telco context. User-side Manager; consumer of the interfaces produced by the VIM; VNFM, NFVO, or Orchestrator in ETSI NFV [NFV003] terminology. Network Function Virtualization Infrastructure; totality of all hardware and software components which build up the environment in which VNFs are deployed. Network Functions Virtualization Orchestrator; functional block that manages the Network Service (NS) lifecycle and coordinates the management of NS lifecycle, VNF lifecycle (supported by the VNFM) and NFVI resources (supported by the VIM) to ensure an optimized allocation of the necessary resources and connectivity. Actual resources in NFVI; not visible to Consumer. Virtualized Infrastructure Manager; functional block that is responsible for controlling and managing the NFVI compute, storage and network resources, usually within one operator’s Infrastructure Domain, e.g. NFVI Point of Presence (NFVI-PoP). Virtualized computation environment that behaves very much like a physical computer/server. A Virtual Machine (VM), a virtual network, or virtualized storage; Offered resources to “Consumer” as result of infrastructure virtualization; visible to Consumer. Virtualized non-volatile storage allocated to a VM. Virtualized Network Function Manager; functional block that is responsible for the lifecycle management of VNF. Resource reservation is a basic function for the operation of a virtualized telecom network. In resource reservation, VIM reserves resources for a certain period as requested by the NFVO. A resource reservation will have a start time which could be into the future. Therefore, the reserved resources shall be available for the NFVO requested purpose (e.g. for a VNF) at the start time for the duration asked by NFVO. Resources include all three resource types in an NFVI i.e. compute, storage and network. Besides, NFVO requires abstracted NFVI resource capacity information in order to take decisions on VNF placement and other operations related to the virtual resources. VIM is required to inform the NFVO of NFVI resource state information for this purpose. Promise project aims at delivering the detailed requirements on these two features defined in ETSI NFV MAN GS [NFVMAN], the list of gaps in upstream projects, potential implementation architecture and plan, and the VIM northbound interface specification for resource reservation and capacity management. OpenStack, a prominent candidate for the VIM, cannot reserve resources for future use. OpenStack requires immediate instantiation of Virtual Machines (VMs) in order to occupy resources intended to be reserved. Blazar can reserve compute resources for future by keeping the VMs in shelved mode. However, such reserved resources can also be used for scaling out rather than new VM instantiation. Blazar does not support network and storage resource reservation yet. Besides, OpenStack does not provide a northbound interface through which it can notify an upper layer management entity e.g. 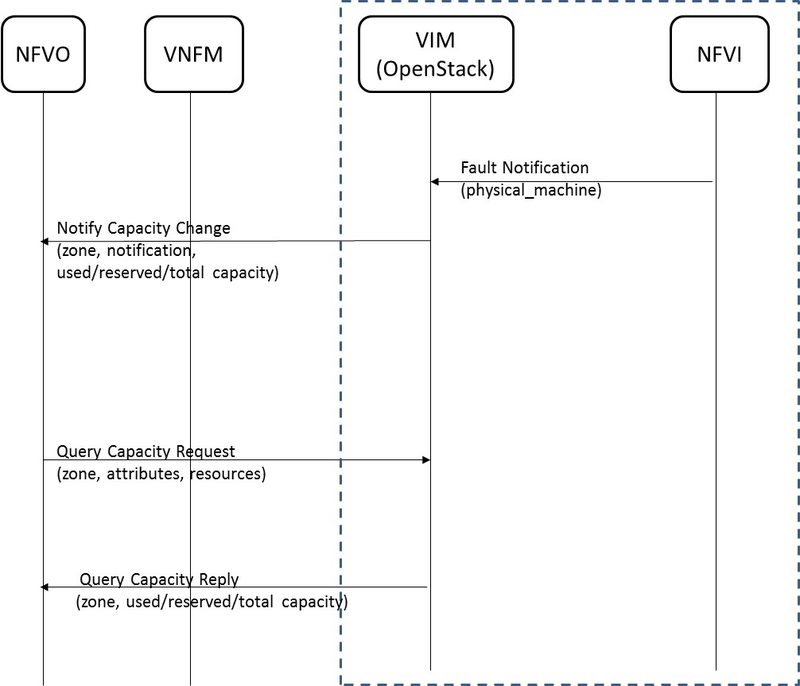 NFVO about capacity changes in its NFVI, periodically or in an event driven way. Capacity management is a feature defined in ETSI NFV MAN GS [NFVMAN] and is required in network operation. Resource reservation is a basic feature in any virtualization-based network operation. In order to perform such resource reservation from NFVO to VIM, NFVI capacity information is also necessary at the NFVO side. Below, four use cases to show typical requirements and solutions for capacity management and resource reservation is presented. A typical use case as considered for the Brahmaputra release is described in ANNEX A: Use case for OPNFV Brahmaputra. NFVO takes the first decision on in which NFVI it would instantiate a VNF. Along with NFVIs resource attributes (e.g. availability of hardware accelerators, particular CPU architectures etc. ), NFVO needs to know available capacity of an NFVI in order to make an informed decision on selecting a particular NFVI. Such capacity information shall be in a coarser granularity than the respective VIM, as VIM maintains capacity information of its NFVI in fine details. However a very coarse granularity, like simply the number of available virtual CPU cores, may not be sufficient. In order to allow the NFVO to make well founded allocation decisions, an appropriate level to expose the available capacity may be per flavor. Capacity information may be required for the complete NFVI, or per partition or availability zone, or other granularities. 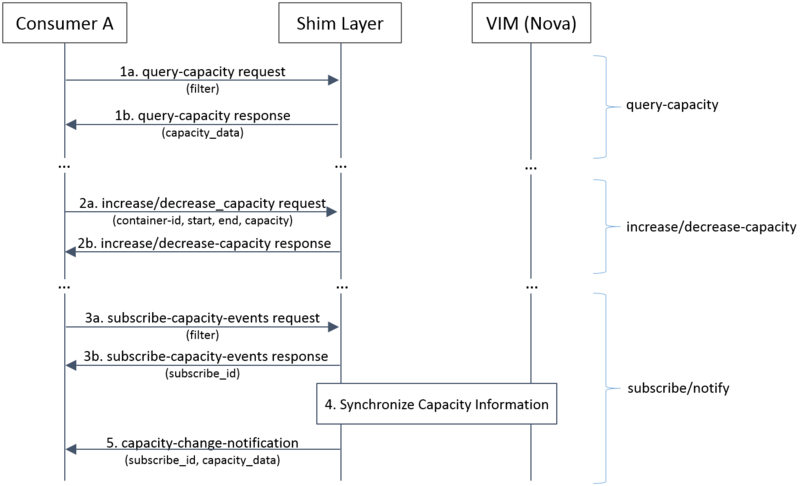 Therefore, VIM requires to inform the NFVO about available capacity information regarding its NFVI at a pre-determined abstraction, either by a query-response, or in an event-based, or in a periodical way. Reservation is inherently for the future. 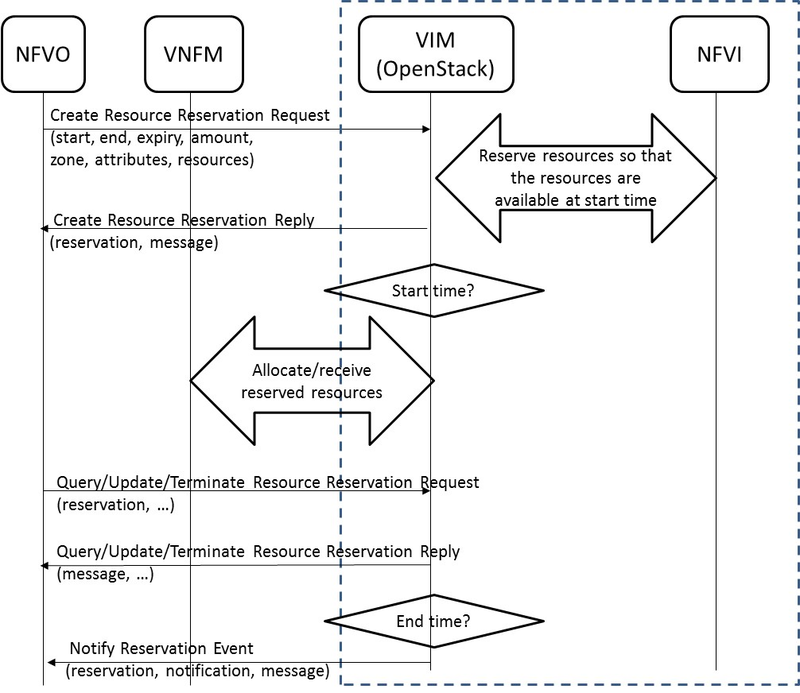 Even if some reserved resources are to be consumed instantly, there is a network latency between the issuance of a resource reservation request from the NFVO, a response from the VIM, and actual allocation of the requested resources to a VNF/VNFM. Within such latency, resource capacity in the NFVI in question could change, e.g., due to failure, allocation to a different request. Therefore, the response from a VIM to the NFVO to a resource reservation request for immediate use should have a validity period which shows until when this VIM can hold the requested resources. During this time, the NFVO should proceed to allocation if it wishes to consume the reserved requested. If allocation is not performed within the validity period, the response from VIM for a particular resource reservation request becomes invalid and VIM is not liable to provide those resources to NFVO/VNFM anymore. Reservations requests for immediate use do not have a start time but may have an end time. Network operators may want to reserve extra resources for future use. Such necessity could arise from predicted congestion in telecom nodes e.g. due to local traffic spikes for concerts, natural disasters etc. In such a case, the NFVO, while sending a resource reservation request to the VIM, shall include a start time (and an end time if necessary). The start time indicates at what time the reserved resource shall be available to a designated consumer e.g. a VNF/VNFM. Here, the requirement is that the reserved resources shall be available when the start time arrives. After the start time has arrived, the reserved resources are allocated to the designated consumer(s). An explicit allocation request is needed. How actually these requested resources are held by the VIM for the period in between the arrival of the resource reservation request and the actual allocation is outside the scope of this requirement project. In a real environment VIM will have to handle allocation requests without any time reference, i.e. time-unbound, together with time-bound reservations and allocation requests with an explicitly indicated end-time. A granted reservation for the future will effectively reduce the available capacity for any new time-unbound allocation request. The consequence is that reservations, even those far in the future, may result in denial of service for new allocation requests. This section describes the expected behavior of the system in different scenarios. As we are targeting a cloud platform with the above use cases, it is crucial to keep the flexibility in the system. By this means it is hard to explicitely block hardware resources for the future and ensure their availablility for allocation therefore it can happen that the reservation plan cannot be fulfilled due to certain changes in the underlying environment. We need to ensure that we are prepared for error and edge cases during the design period. Fig. 4.1 shows the high level architecture for the resource reservation use cases. Reserved resources are guaranteed for a given user/client for the period expressed by start and end time. User/client represents the requestor and the consequent consumer of the reserved resources and correspond to the NFVO or VNFM in ETSI NFV terminology. Note: in this document only reservation requests from NFVO are considered. This section provides a list of features that need to be developed in the Promise project. Update available resource capacity as a result of new or expired reservations, addition/removal of resources. Note: this is a VIM internal function, not an operation in the VIM northbound interface. Fig. 4.2 shows a high level flow for a use case of resource capacity management. In this example, the VIM notifies the NFVO of capacity change after having received an event regarding a change in capacity (e.g. a fault notification) from the NFVI. The NFVO can also retrieve detailed capacity information using the Query Capacity Request interface operation. Fig. 4.3 shows a high level flow for another use case of resource capacity management. In this example, the NFVO queries the VIM about the actual capacity to instantiate a certain resource according to a certain template, for example a VM according to a certain flavor. In this case the VIM responds with the number of VMs that could be instantiated according to that flavor with the currently available capacity. The NFVO sends a resource reservation request to the VIM using the Create Resource Reservation Request interface operation. The detailed specification of the northbound interface for Capacity Management in provided in section 5.1.1. Attributes List Attributes of the resources to be reserved such as DPDK support, hypervisor, network link bandwidth, affinity rules, etc. Reservation Identifier Identification of the reservation instance. It can be used by a consumer to modify the reservation later, and to request the allocation of the reserved resources. The detailed specification of the northbound interface for Resource Reservation is provided in section 5.1.2. This section provides a list of gaps in upstream projects for realizing resource reservation and management. The gap analysis work focuses on the current OpenStack Blazar project [BLAZAR] in this first release. To-be: To have the possibility of giving a quotation to a requesting user and an expiration time. Reserved resources shall be released if they are not claimed before this expiration time. Within the Promise project we consider two different architectural options, i.e. a shim-layer based architecture and an architecture targeting at full OpenStack integration. The shim-layer architecture is using a layer on top of OpenStack to provide the capacity management, resource reservation, and resource allocation features. Note, that only selected parameters for the messages are shown. Refer to Detailed northbound interface specification and Annex ANNEX B: Promise YANG schema based on YangForge for a full set of message parameters. Step 1a: The Consumer sends a query-capacity request to Promise using some filter like time-windows or resource type. The capacity is looked up in the shim-layer capacity map. Step 1b: The shim-layer will respond with information about the total, available, reserved, and used (allocated) capacities matching the filter. Step 2a: The Consumer can send increase/decrease-capacity requests to update the capacity available to the reservation system. It can be 100% of available capacity in the given provider/source or only a subset, i.e., it can allow for leaving some “buffer” in the actual NFVI to be used outside the Promise shim-layer or for a different reservation service instance. It can also be used to inform the reservation system that from a certain time in the future, additional resources can be reserved (e.g. due to a planned upgrade of the capacity), or the available capacity will be reduced (e.g. due to a planned downtime of some of the resources). Step 2b: The shim-layer will respond with an ACK/NACK message. Step 3a: Consumers can subscribe for capacity-change events using a filter. Step 3b: Each successful subscription is responded with a subscription_id. Step 4: The shim-layer monitors the capacity information for the various types of resources by periodically querying the various Controllers (e.g. Nova, Neutron, Cinder) or by creating event alarms in the VIM (e.g. with Ceilometer for OpenStack) and updates capacity information in its capacity map. Step 5: Capacity changes are notified to the Consumer. Step 1a: The Consumer creates a resource reservation request for future use by setting a start and end time for the reservation as well as more detailed information about the resources to be reserved. The Promise shim-layer will check the free capacity in the given time window and in case sufficient capacity exists to meet the reservation request, will mark those resources “reserved” in its reservation map. Step 1b: If the reservation was successful, a reservation_id and status of the reservation will be returned to the Consumer. In case the reservation cannot be met, the shim-layer may return information about the maximum capacity that could be reserved during the requested time window and/or a potential time window where the requested (amount of) resources would be available. Step 2a: Reservations can be updated using an update-reservation, providing the reservation_id and the new reservation_data. Promise Reservation Manageer will check the feasibility to update the reservation as requested. Step 2b: If the reservation was updated successfully, a reservation_id and status of the reservation will be returned to the Consumer. Otherwise, an appropriate error message will be returned. Step 3a: A cancel-reservation request can be used to withdraw an existing reservation. Promise will update the reservation map by removing the reservation as well as the capacity map by adding the freed capacity. Step 3b: The response message confirms the cancelation. Step 4a: Consumers can also issue query-reservation requests to receive a list of reservation. An input filter can be used to narrow down the query, e.g., only provide reservations in a given time window. 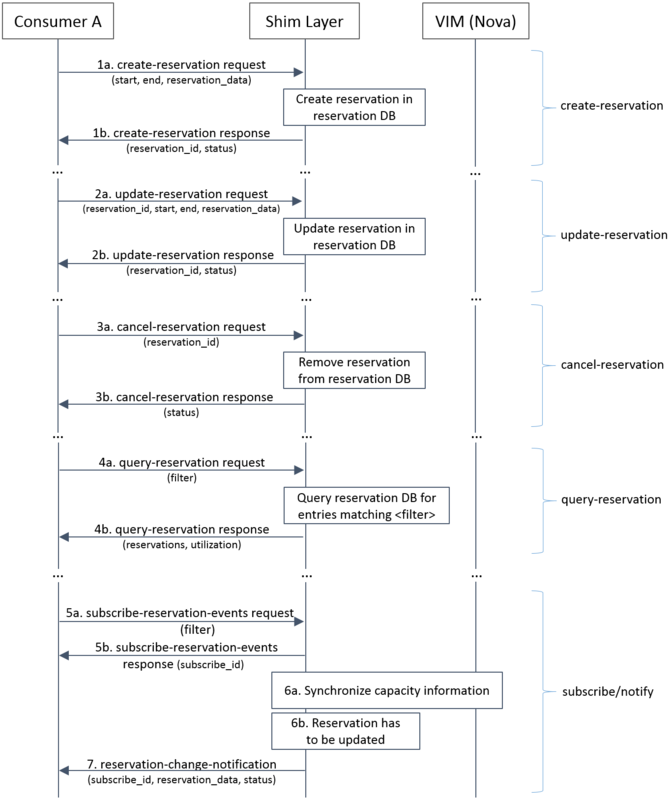 Promise will query its reservation map to identify reservations matching the input filter. Step 4b: The response message contains information about all reservations matching the input filter. It also provides information about the utilization in the requested time window. Step 5a: Consumers can subscribe for reservation-change events using a filter. Step 5b: Each successful subscription is responded with a subscription_id. Step 6a: Promise synchronizes the available and used capacity with the underlying VIM. Step 6b: In certain cases, e.g., due a failure in the underlying hardware, some reservations cannot be kept up anymore and have to be updated or canceled. The shim-layer will identify affected reservations among its reservation records. Step 7: Subscribed Consumers will be informed about the updated reservations. The notification contains the updated reservation_data and new status of the reservation. It is then up to the Consumer to take appropriate actions in order to ensure high priority reservations are favored over lower priority reservations. Step 1a: The Consumer sends a create-instance request providing information about the resources to be reserved, i.e., provider_id (optional in case of only one provider), name of the instance, the requested flavour and image, etc. If the allocation is against an existing reservation, the reservation_id has to be provided. Step 1b: If a reservation_id was provided, Promise checks if a reservation with that ID exists, the reservation start time has arrived (i.e. 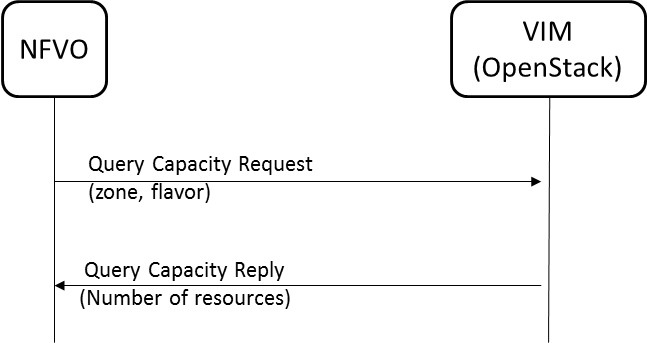 the reservation is active), and the required capacity for the requested flavor is within the available capacity of the reservation. If those conditions are met, Promise creates a record for the allocation (VMState=”INITIALIZED”) and update its databases. If no reservation_id was provided in the allocation request, Promise checks whether the required capacity to meet the request can be provided from the available, non-reserved capacity. If yes, Promise creates a record for the allocation and update its databases. In any other case, Promise rejects the create-instance request. Step 2: In the case the create-instance request was rejected, Promise responds with a “status=rejected” providing the reason of the rejection. This will help the Consumer to take appropriate actions, e.g., send an updated create-instance request. The allocation work flow will terminate at this step and the below steps are not executed. Step 3a: If the create-instance request was accepted and a related allocation record has been created, the shim-layer issues a createServer request to the VIM Controller providing all information to create the server instance. Step 3b: The VIM Controller sends an immediate reply with an instance_id and starts the VIM-internal allocation process. Step 4: The Consumer gets an immediate response message with allocation status “in progress” and the assigned instance_id. Step 5a+b: The consumer subscribes to receive notifications about allocation events related to the requested instance. Promise responds with an acknowledgment including a subscribe_id. Step 6: In parallel to the previous step, Promise shim-layer creates an alarm in Aodh to receive notifications about all changes to the VMState for instance_id. Step 7a: The VIM Controller notifies all instance related events to Ceilometer. After the allocation has been completed or failed, it sends an event to Ceilometer. This triggers the OpenStack alarming service Aodh to notify the new VMState (e.g. ACTIVE and ERROR) to the shim-layer that updates its internal allocation records. Step 7b: Promise sends a notification message to the subscribed Consumer with information on the allocated resources including their new VMState. Step 8a+b: Allocated instances can be terminated by the Consumer by sending a destroy-instance request to the shim-layer. Promise responds with an acknowledgment and the new status “DELETING” for the instance. Step 9a: Promise sends a deleteServer request for the instance_id to the VIM Controller. Step 10a: After the instance has been deleted, an event alarm is sent to the shim-layer that updates its internal allocation records and capacity utilization. Step 10b: The shim-layer also notifies the subscribed Consumer about the successfully destroyed instance. In the following, the internal logic and operations of the shim-layer will be explained in more detail, e.g. the “check request” (step 1b in Fig. 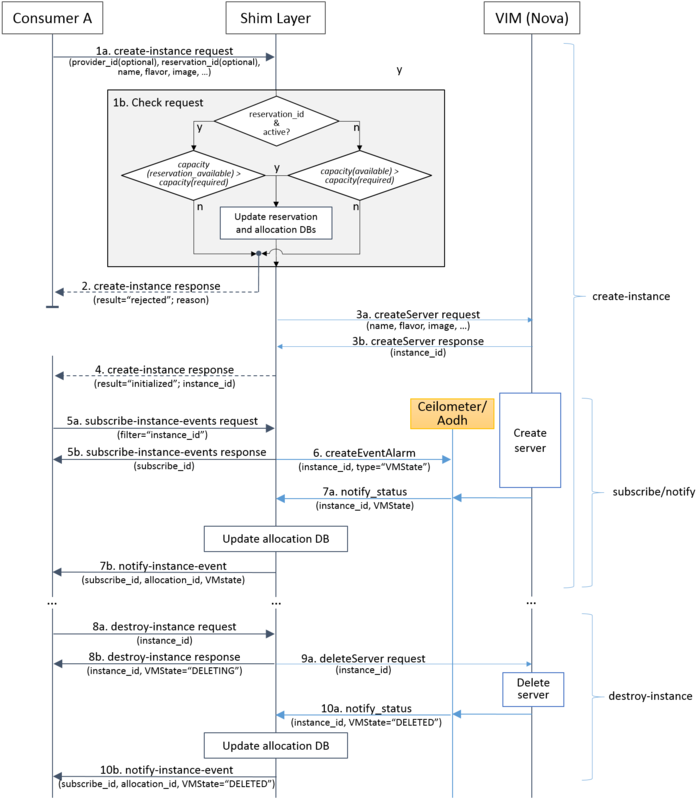 6.3 of the allocation work flow). The integrated architecture aims at full integration with OpenStack. This means that it is planned to use the already existing OpenStack APIs extended with the reservation capabilities. The advantage of this approach is that we don’t need to re-model the complex resource structure we have for the virtual machines and the corresponding infrastructure. The atomic item is the virtual machine with the minimum set of resources it requires to be able to start it up. It is important to state that resource reservation is handled on VM instance level as opposed to standalone resources like CPU, memory and so forth. As the placement is an important aspect in order to be able to use the reserved resources it provides the constraint to handle resources in groups. The placement constraint also makes it impossible to use a quota management system to solve the base use case described earlier in this document. OpenStack had a project called Blazar, which was created in order to provide resource reservation functionality in cloud environments. It uses the Shelve API of Nova, which provides a sub-optimal solution. Due to the fact that this feature blocks the reserved resources this solution cannot be considered to be final. Further work is needed to reach a more optimal stage, where the Nova scheduler is intended to be used to schedule the resources for future use to make the reservations. Due to integration difficulties the Blazar project got suspended. Since the last activities in that repository the OpenStack code base and environment changed significantly, which means that the project’s code base needs to be updated to the latest standards and has to be able to interact with the latest version of the other OpenStack services. The REST API needs to be extended to contain the attributes for the reservation defined in this document. This activity shall include testing towards the new API. The status and the possible interface between the resource reservation system and the Nova scheduler needs to be identified. It is crucial to achieve a much more optimal solution than what the current version of Blazar can provide. The goal is to be able to use the reserved resources before the reservation starts. In order to be able to achieve this we need the scheduler to do scheduling for the future considering the reservation intervals that are specified in the request. The design for the more optimal solution can be defined only after analyzing the structure and capabilities of the Nova scheduler. This phase can be started in parallel with the previous one. A compute flavor includes information about number of virtual CPUs, size of virtual memory, size of virtual storage, and virtual network interfaces [NFVIFA005]. Request to find out about available, reserved, total and allocated compute capacity. limit – Default is 10. Request to find out about reserved compute resources that the consumer has access to. Subscription from Consumer to VIM to be notified about changes related to a reservation or to the resources associated to it. Request to find out about available, reserved, total and allocated network capacity. Request to find out about reserved network resources that the consumer has access to. Request to find out about available, reserved, total and allocated storage capacity. Request to find out available capacity. Request to find out about reserved storage resources that the consumer has access to. Resource Reservation and Resource Capacity Management are features to be supported by the VIM and exposed to the consumer via the VIM NBI. These features have been specified by ETSI NFV. The Promise project has performed a gap analysis in order to fulfill the required functionality. Based on the gap analysis an implementation plan and way forward has been proposed, including a possible design architecture and high level information model. Immediate next steps of this project is to deliver a working Proof-of-Concepts (PoC) and engage upstream communities to fill out the gaps identified by Promise. Step 4 (optional): Consumer(NFVO) is sending an update reservation request to shim-layer (startTime set to now) -> continue with Steps 2 and 3.
required for fulfillment of the resource-usage-request. into 'protected' mode as to prevent accidental removal. created usually as a result of 'create-reservation' request. as to track allocations made referencing this reservation. on the 'source' of the ResourcePool. Register a new resource provider (e.g. OpenStack) into reservation system. Make a request to the reservation system to reserve resources. Update reservation details for an existing reservation. Query the reservation system to return matching reservation(s). Create an instance of specified resource(s) utilizing capacity from the pool. Destroy an instance of resource utilization and release it back to the pool. "message": "instance destroyed and resource released back to pool"
Decrease total capacity for the reservation system for a given time window. Increase total capacity for the reservation system for a given time window. Query for capacity information about a specified resource collection.